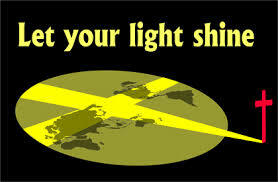 Matthew 5:14-16, Ye are the light of the world. A city that is set on an hill cannot be hid. 15 Neither do men light a candle, and put it under a bushel, but on a candlestick; and it giveth light unto all that are in the house. 16 Let your light so shine before men, that they may see your good works, and glorify your Father which is in heaven. Philippians 2:14-16, Do all things without murmurings and disputings: 15 That ye may be blameless and harmless, the sons of God, without rebuke, in the midst of a crooked and perverse nation, among whom ye shine as lights in the world; 16 Holding forth the word of life; that I may rejoice in the day of Christ, that I have not run in vain, neither laboured in vain. Both Jesus and the Apostle Paul had something to say about God’s people shining brightly for Christ and the cause of Christ in a dark and decrepit world. Jesus didn’t say we should be “the light of the world.” He said we “are the light of the world.” The question is, are we SO shining outside the four walls of our “church” sanctuary that men, women, and young people can see our “good works” and glorify our Father who is in heaven? It is interesting that these words of Jesus are found in the Sermon on the Mount and immediately after the Beatitudes. Where else can one better find the “how to’s” of letting our light SO shine before men than in the Sermon on the Mount and in the Beatitudes? The greatest sermon ever preached and the greatest truths ever taught can be found in Matthew chapters 5-7. When your light isn’t shining as brightly as it ought to, it is good to take time to read, pause, ponder, and pray over the words found in these three chapters. Not sure if you noticed, but it’s getting “dark” out there. That Judeo-Christian culture that our parents talked about doesn’t exist anymore. If there ever was a “Moral Majority,” they don’t exist any more. While there was a time that the church of Jesus Christ had much favor in our land, those days are slipping away rapidly. So what are you going to do about it? 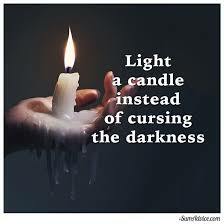 Let’s not spend our time “cursing the darkness.” Darkness exists because light has not yet penetrated it. Rather than “cursing the darkness” let’s be the light and bring the light, life, and love of Christ where it is most needed! We don’t need our light so much for inside the four walls of our church sanctuaries. We need to shine among our church family of course, but we especially need our light to leave the comfort of our church family and go where it’s really needed-out in the dark. That would start of course, in our “Jerusalem” and continue to extend to the uttermost parts of the earth where the darkness is unfathomable. Is someone outside of the “church” thanking God for you today? Just taking a few moments to reflect on the “red letters” of Jesus!